Wood & Metal Gates Northern Virginia | Call (703) 971-0660 for expert wood or metal gate installation | gates. 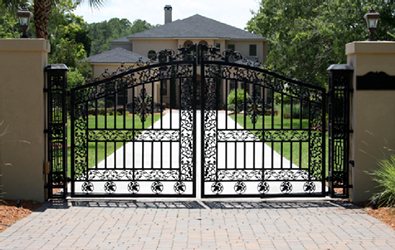 wood gates, metal gates, estate gates, security gates, privacy gates, fences, fencing, wood fence, wood fences, metal fence, metal fences, picket fence, picket fences, split rail fence, ranch fence, security fence, privacy fence, paddock fence, estate fence, custom fence, custom fences, wood gates, metal gates, and chain link fences in Northern Virginia and Metro Washington DC. Gate Fences, Gate Fencing, Residential Wood Gates, Commercial Wood Gates, Steel Gates, Fencing, Fences, Wood Gate Repairs, Metal Gate Alterations, Gate Additions in Springfield, Lorton, Burke, Fairfax Station, Fairfax, Arlington, Falls Church, Alexandria and all of Northern Virginia, Montgomery County, and Washington, DC since 1985. 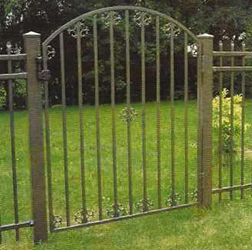 Accokeek Fence Co. manufactures your gate to fit the fence design and your requirements. We understand the importance of a properly constructed wood fence gate. The gate is the ONLY part of the fence the consumer uses. The gate is also the ONLY moving part of your wood fence. Our gates are GUARANTEED not to sag for 90 days after installation. Please don't confuse sagging with warping. Warping is something that is NOT covered under our warranty, but can be prevented by staining, water sealing, or weather proofing your wood fence. The hinges and gate latches are black in color and made from galvanized steel covered with a black powder coat finish. 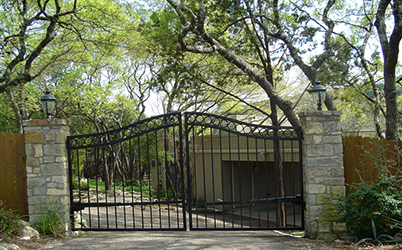 Gates need to be built from scratch, unless it is a chain link, vinyl, or aluminum, and all wood gates should be custom made and not pre-purchased. Accokeek Fence Co. manufactures your gate to fit the fence design and your requirements. We understand the importance of a properly constructed wood fence gate. The gate is the ONLY part of the fence the consumer uses. The gate is also the ONLY moving part of your wood fence. Our company installs ALL gates with our standard 90 day not to sag warranty guarantee. Please don't confuse sagging with warping. Warping is something that is NOT covered under our warranty, but can be prevented by staining, water sealing, or weather proofing your wood fence. The hinges and gate latches are black in color and made from galvanized steel covered with a black powder coat finish. Gates need to be built from scratch, unless it is a chain link, vinyl, or aluminum, and all wood gates should be custom made and not pre-purchased. A fully functioning gate is important and someone who did not build a gate correctly will have problems in a few days or even weeks. Accokeek Fence Co. manufactures your wood estate gate to fit the fence design and your requirements. Accokeek Fence Co. knows that homeowners often elect to use steel for their residential home entrance gates which provide maximum security. The style of steel gates is sure to add class to any commercial or residential entrance. Accokeek Fence Co. is proud to offer a variety of gate options including driveway gates, fence gates, garden gates and more. Our gate and fence installation experts are trained to build home and business fences to assure our customers have a secure and aesthetically pleasing installation and look.